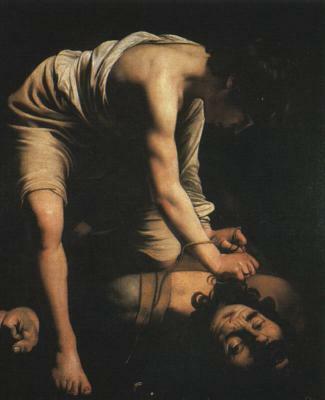 David and Goliath, Caravaggio. Prado Museum Madrid. ROME --The Eternal City's museums are replete with Caravaggio exhibitions. There are many tours of the streets in the city where he lived, moved, worked, ate, drank, fought, and painted masterpieces posing the people of these streets. The last decade has produced an abundance of studies, books, and movies about the great painter. This year his presence in Rome is palpable. He was volatile, unpredictable, and violent. He killed a man in a sword fight on a Sunday night, May 29, 1606. He became a wanted man and fled the city, never to return. I’m not entirely comfortable with the word “murderer” for Caravaggio, it’s not quite right. Wasn’t it a sword fight-duel? HJere is a short summary of Caravaggio’s police records that can give us something about the state of mind of our hero artist in Rome, soon to become a criminal fugitive. He was arrested for throwing a plate of hot artichokes in a waiter's face. The artist asked, "Are they cooked in butter or in oil?" The waiter responded, "Taste them and see." Wrong answer. He was arrested for throwing rocks at his former land lady’s Venetian blinds. He was arrested for carrying a sword without a permit. Caravaggio had quite a number of paintings rejected. Even though his contemporaries were copying his style, those mediocre artists were getting all the good commissions. Guido Reni is more than a mediocre artist, but if you are standing in the Vatican Museum’s Picture Gallery, la Pinacoteca, in front of Reni’s Crucifixion of Saint Peter, a wonderful, balanced, and tasteful painting, it recedes in a sense to become one with the plane of the wall, like wallpaper, like all the other paintings in that room, because Caravaggio’s Deposition from the Cross on an adjacent wall, dominates and takes over the entire space. The same can be said of the compitent Holy Trinity, by AnibeleCarraci in the church of Santa Maria del Popolo on the back altar wall. It is flanked on the sides by Caravaggio’s Crucifixion of Saint Peter and his Conversion of Saint Paul. It’s hard to concentrate on the Carraci. Viewers are drawn into Caravaggio’s paintings. He speaks to us today. He was not always revered. He had "abandoned beauty for mere likeness" a contemporary critic said, and Bellori said he took the art out of art, what he meant was that he did not draw based on classical modes. It seems that he was predisposed to violence, but these pervasive insults could make one want to sharpen ones sword. I want to make the point that the extremes of suffering experienced by Caravaggio along with his ever present ability to see beauty everywhere made it possible for him to become a painter of miracles. That is what the great American writer, Francine Prose, calls him in her biography, Caravaggio, Painter of Miracles, 2005, HarperCollins. Prose says “…during his last years in Rome, he felt that his primacy was beginning to slip, that the light of respect and acclaim was beginning to shine on artists like Guido Reni, whose work he detested, disappointment and anger drove him to the edge of a sort of madness.” p. 15. And: “The life of Caravaggio is the closest thing we have to the myth of the sinner-saint, the street tough, the martyr, the killer, the genius- the myth that, in these jaded and secular times, we are ashamed to admit that we still long for, and need. The arc of his life seems biblical as it compresses the Bible’s core- the fall of man, the redemption of man, the life eternal and everlasting- into one individual’s truncated existence.” p.13. Caravaggio was thirty nine years old when he died. Remember, Raphael died at thirty seven on Good Friday, the day he was born, and it is said that there was an earthquake in Rome. The Romans said nature was crying for the grace-filled painter. Caravaggio’s mysterious and wonderful painting of The Death of the Virgin is in the Musee de Louvre in a place of honor. It was initially rejected maybe because he used as a model for the Virgin, a prostitute who had drown in the Tiber. Everyone knew who she was. Now, critics marvel at the painter’s ability to show gestures of extreme emotion and of grief in the powerful scene. He knew how to paint these things because he lived in the extreme. I am puzzled over something cast in bronze in a plaque in Rome, one of a number of permanent new plaques marking places of significance in the life of Caravaggio, solidifying his legacy and his importance to the city in what has become the year of Caravaggio. It says that it is not known if his adversary, Ranuccio Tomasonni was mortally wounded in the sword fight, or once wounded, on the ground, Caravaggio to further humiliate him, killed him. Guess that’s the worst kind of humiliation. Why would an official city plaque print such a wildly bizarre and purely speculative thought? It is mind reading four centuries removed. Surprisingly in death, even now, as in life, Michelangelo Merisi di Caravaggio has his defamers. It is like the editorializing ugliness of what Caravaggio’s contemporary biographer, fellow painter, and jealous competitor, Gian Pietro Bellori, said of the great painter’s death (of which little is known for sure), “And he died as miserably as he had lived.” We know his death was not a day at the beach. Well, it literally was. He was finally pardoned and was returning to Rome, he missed the boat carrying his belongings, including late paintings, and he ran after the boat and died on the beach at Port Ercole. Oh, and just this year Port Ercole to get in on Caravaggistic mania, paraded out some bones of a man and claimed that it was Caravaggio. It is disdainful of Bellori to say Caravaggio died miserably. We can never know how another dies, what visions they may see at the last. An artist friend from Boston once told me she did not believe in God because of the suffering of men. She mentioned the beggar dying by the side of the road in India. I said, how do we know what he is going through, what he thinks, he may be writing the symphonic response to Beethoven’s Ninth. I think she equated quality of life with value of life. As Caravaggio lay on the beach dying a young priest that looked exactly like the master’s painting of the young Saint John the Baptist may have come along to forgive him the sins of his youth and give him the last rights. 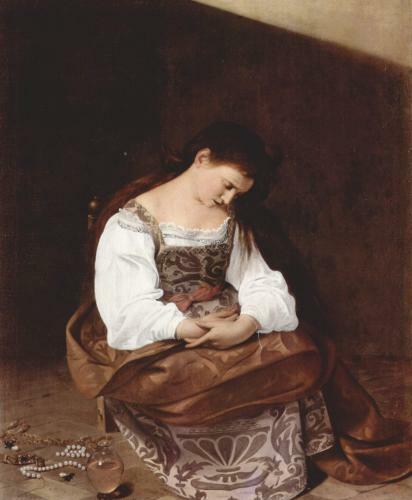 Or a Mediterranean mermaid looking just like his young Repentant Magdalene, the one his girl friend posed for, the early masterpiece in Doria Pamphili Museum, may have come by in time to hold his head as he expired, he may have gone with beauty before his eyes. It is presumptive to pretend to know of another’s death. If we accept Bellori’s premise that he died as he lived, we can guess that he died as he had lived, surrounded by bad luck (he was arrested because of mistaken identity and missed the boat) but always consumed by transcendent beauty.